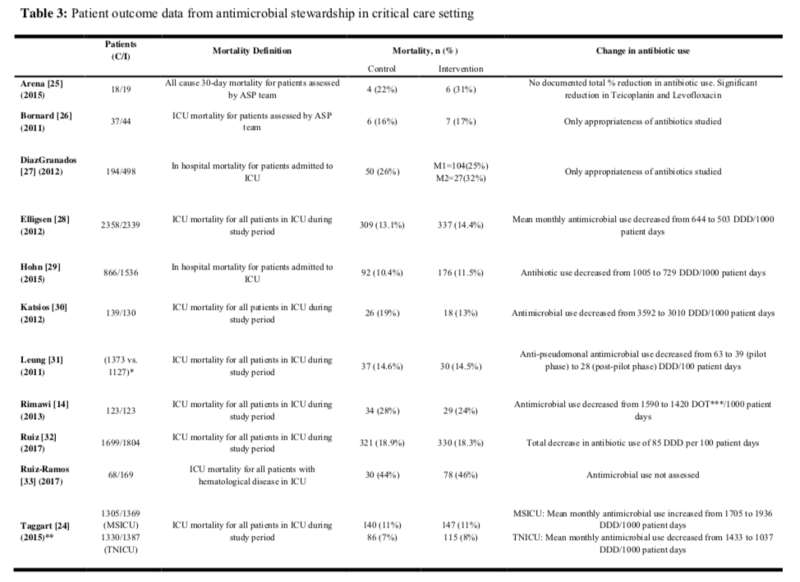 トップ > ASP > Antimicrobial Stewardship and Intensive Care Unit (ICU) Mortality: A systematic review. 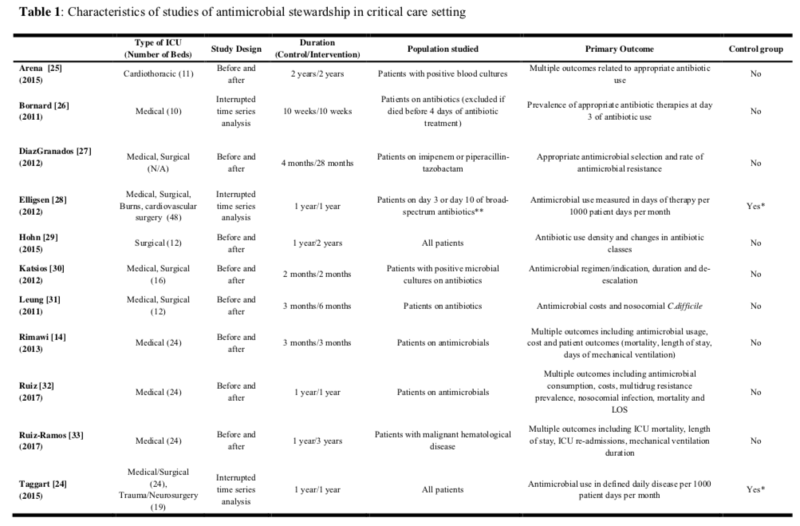 Antimicrobial Stewardship and Intensive Care Unit (ICU) Mortality: A systematic review. Five studies ; the pooled relative risk of ICU mortality was 1.03 (95% CI, 0.93 - 1.14). three smaller studies ; pooled relative risk of ICU mortality of 1.06 (95% CI, 0.80 to 1.4). 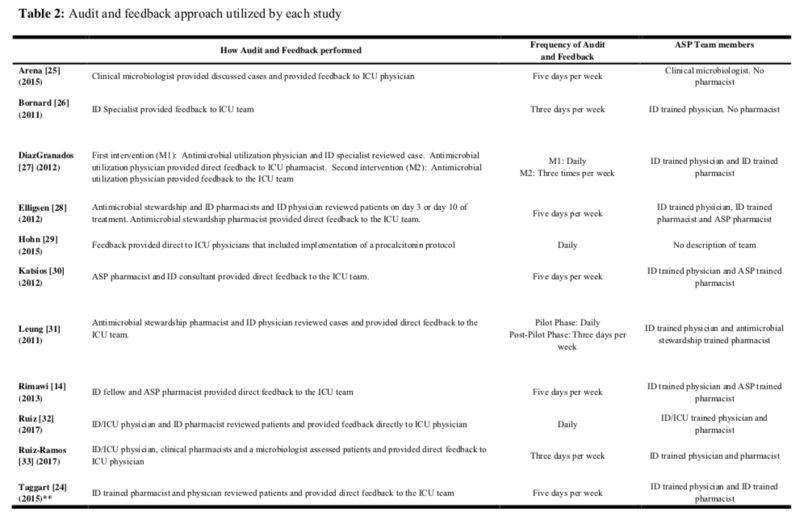 Antimicrobial stewardship programs (ASP) using audit and feedback in the intensive care unit setting (ICU) can reduce harms related to inappropriate antibiotic use. However, inappropriate discontinuation or narrowing of antibiotic treatment could increase infection-related mortality in this population. Individual ASP studies are underpowered to detect mortality differences. We conducted a systematic review and meta-analysis of audit and feedback in the ICU setting using mortality as our outcome. Of 2447 citations, 11 studies met our inclusion criteria. Although a variety of study designs were used to assess reductions in antibiotic utilization, mortality was analyzed using an uncontrolled before-after study design in all studies. Five studies directed audit and feedback at all or most ICU patients on antibiotics and measured overall ICU mortality. In the meta-analysis of these studies, the pooled relative risk of ICU mortality was 1.03 (95% CI, 0.93 - 1.14). A second meta-analysis of three smaller studies that evaluated mortality only in patients directly assessed by the ASP found a pooled relative risk of ICU mortality of 1.06 (95% CI, 0.80 to 1.4). Three studies were not appropriate for meta-analysis, but their results were consistent with our overall findings. Our systematic review did not identify a change in mortality associated with antimicrobial stewardship using audit and feedback in the ICU setting. These results increase our confidence that audit and feedback can be safely implemented in this setting. Future studies should report standardized estimates of mortality and use more robust study designs to assess mortality, when feasible.